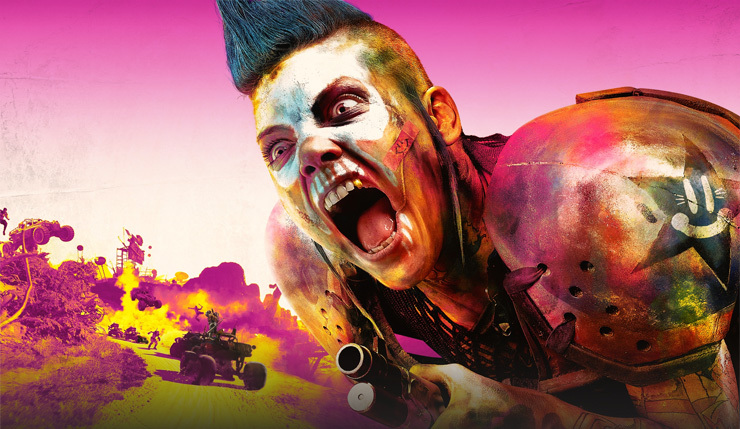 Rage 2 has been one of this year’s big surprises – not many expected to see Id Software’s open-world shooter series make its return, but the new game, developed by Avalanche Software (Just Cause, Mad Max) certainly looks promising. Today during their QuakeCon 2018 Keynote, Bethesda released gritty new Rage 2 footage. You can check it out, below. While the Rage 2’s E3 trailer mostly focused on your typical dusty Mad-Max-style environments, the new QuakeCon footage showed off a bit more variety. In fact, you’ll start the game off in a lush wetlands area, and along the way explore jungles, mountains, and more. The variety extends to the game’s factions (the Goon Squad, Immortal Shrouded, River Hogs, Abaddon Mutants, and Authority, to name a few) each of which have different combat styles, settlements, and vehicles. Speaking of vehicles, we also get a look at an explosive convoy takedown. Overall, Rage 2 looks like a good fusion of id Software action and Avalanche open-world mayhem. The new footage culminates in an intense shootout with the Goon Squad, which showcases some of the game’s new abilities, including Slam (punch the ground to unleash destructive shockwaves) and Shatter (send baddies flying with a blast of kinetic energy). Oh, and your boomerang-like Wingstick has also been upgraded. Rage 2 rampages on PC, Xbox One, and PS4 in Spring 2019.